The traditional design for Director’s Chairs dates to the 19th century. Putting a new twist on their award-winning design, Gold Medal Chairs has created a new chair available exclusively from Everywhere Chair. 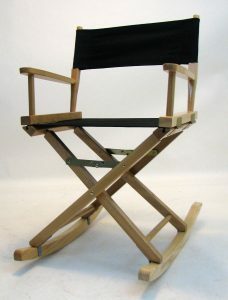 The Rocking Director’s Chair is their natural 18″ frame on two solid wood rockers. This is one stylish and comfortable chair! Gold Medal Chairs is located in Tennessee. All of their chairs are made in America out of American hardwoods from managed forests. The Gold Medal name is synonymous with quality craftsmanship. All of their chairs come with a 3 year manufacturer’s warranty. An Everywhere Chair exclusive, the Rocking Director’s Chair will make the perfect addition to your reading corner, bedroom or porch, offering anyone the perfect place to sit and rock. It is the perfect gift for a retiree to rock away their retirement, a teacher or college graduate. Canvas covers are available in a variety of colors and can be customized with logos, pictures and text just like any of our Director’s Chairs to make that gift extra-special. From the Beach to the Arctic – An Overview of Our First Trade ShowAdd Flare to Your Chair!